A post on the Guardian Datablog earlier today took a dataset collected by the Tweetminster folk and graphed the sorts of thing that journalists tweet about ( Journalists on Twitter: how do Britain’s news organisations tweet?). 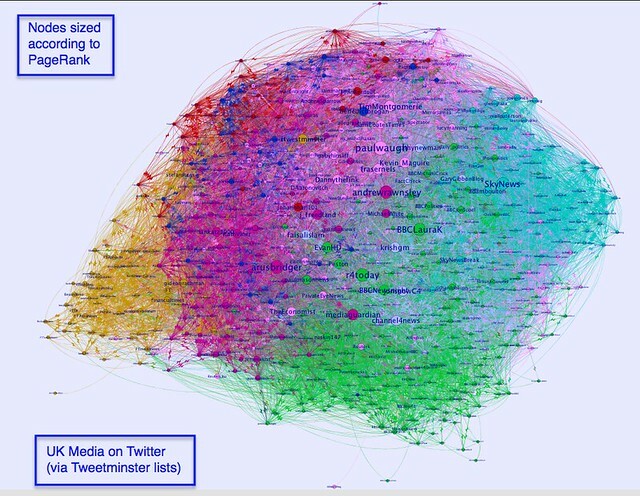 Nodes are coloured by media group/Tweetminster list, and sized by PageRank, as calculated over the network using the Gephi PageRank statistic. The force directed layout shows how folk within individual media groups tend to follow each other more intensely than they do people from other groups, but that said, inter-group following is still high. The major players across the media tweeps as a whole seem to be @arusbridger, @r4today, @skynews, @paulwaugh and @BBCLauraK. Doodlings Around the Data Driven Journalism Round Table Event Hashtag Community. 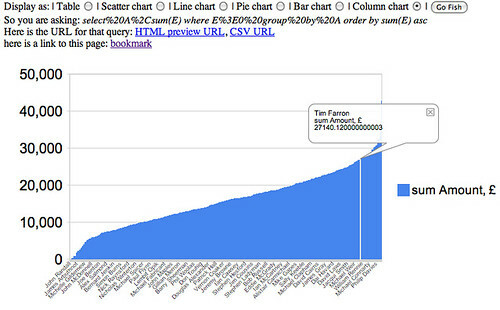 This entry was posted in data journalism and tagged newsrw, onlinejournalismblog, tony hirst, visualisation on April 10, 2011 by Paul Bradshaw. It’s an modern day battle: journalist versus blogger. 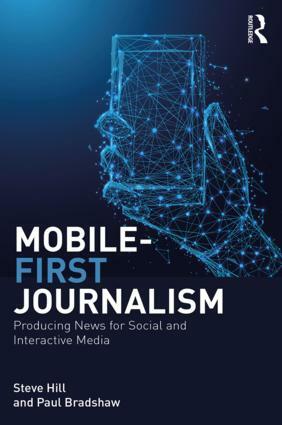 Often operating in the same field, but with very different aims and objectives, some traditional reporters are wary of this new breed of content creator. However, a new Beat-Blogger role, created by The Guardian, has brought the 2 fields closer together. Having a local blogger based in several cities around the UK, The Guardian has given itself direct contact with the community, something a national paper would often overlook. Hannah Waldram is the beat-blogger in Cardiff. At News:Rewired she told OJB more about how the new project is going, and how it has been accepted in the city. This entry was posted in newspapers and tagged beatblogging, Guardian, Hannah Waldram, Hyperlocal, interview, news:rewired, newsrw on June 29, 2010 by Paul Bradshaw. With so much news content available online and a host of ways to promote and share that material it’s often hard for journalists and bloggers to know how to make their content stand out. There are a host of companies offering a quick fix to this problem with promises of Facebook friends and sky-high traffic stats. However, some of the most successful blogs go for a niche audience who care about the subject matter, and spread the word organically. This entry was posted in blogging and tagged news:rewired, newsrw, pr, promotion, Tony Curzon-Price, Vikki Chowney on June 28, 2010 by Paul Bradshaw. With 2 years to go to the 2012 Olympics, the BBC are already starting to plan their online coverage of the event. With a large, creative team at hand who have experimented with maps, visualisations and interactive content in the past, the pressure is on them to keep the standards high. At the recent News:Rewired event, OJB caught up with Olympics Reporter Ollie Williams, himself a visualisation guru, to find out exactly what they were planning for 2012. 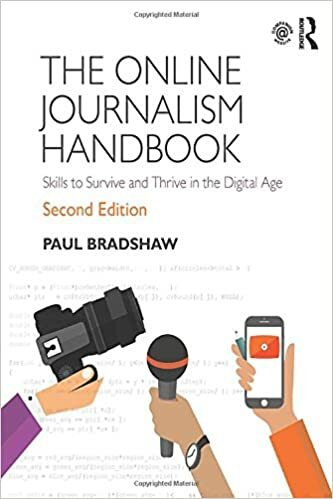 This entry was posted in data journalism, television and tagged 2012 olympics, BBC, interactivity, news:rewired, newsrw, ollie williams, olympics, visualisation on June 28, 2010 by Paul Bradshaw. Video interview: The Times: safeguarding journalism? This entry was posted in blogging and tagged news:rewired, newsrw, paywalls, the times, Times, Tom Whitwell on June 28, 2010 by Paul Bradshaw. thanks to the work of Guardian developer Daniel Vydra and his team, we’ve managed to scrape the entire lot out of the Commons website for you as a downloadable spreadsheet. You cannot get this anywhere else. So, just pasting the spreadsheet key and authorisation token into the cut down Guardian datastore explorer script I used in Using CSV Docs As a Database to generate an explorer for the expenses data. 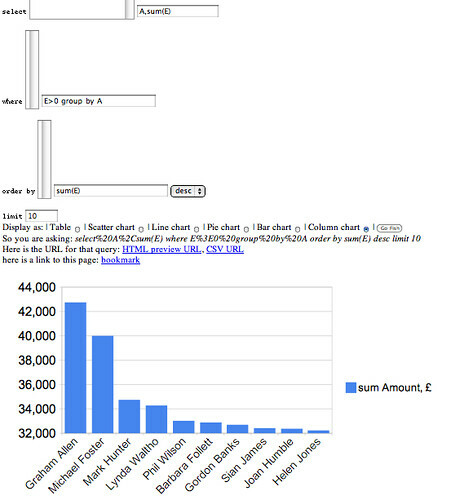 Or how about claims over 5000 pounds (also viewing the information as an HTML table, for example). Remember, on the datastore explorer page, you can click on column headings to order the data according to that column. We can also (now!) limit the number of results returned, e.g. to show the 10 MPs with lowest claims to date (the datastore blog post explains that why the data is incomplete and to be treated warily). Okay – enough for now; the reason I’m posting this is in part to ask the question: is the this an unfair use of the Guardian datastore data, does it detract from the work they put in that lets them claim “You cannot get this anywhere else”, and does it impact on the returns they might expect to gain? PS It seems there was a minor “issue” with the settings of the spreadsheet, a result of recent changes to the Google sharing setup. Spreadsheets should now be fully viewable… But as I mention in a comment below, I think there are still interesting questions to be considered around the extent to which publishers of “public” data can get a return on that data? This entry was posted in data journalism and tagged data, datastore, newsrw, onlinejournalismblog, rights, tony hirst on June 25, 2010 by Paul Bradshaw.